They say we now have a paperless society. I don't think so. If you still need to print documents or graphics on paper, you probably have occasional problems with your printer. Sometimes the printer chokes on a print job or it jams in the middle of printing a multi-page document. In that case you need to delete the print job from the print queue. You could navigate to the print queue the usual way, open Control Panel, select the Devices and Printers group, right-click on the active printer and, in the popup menu that appears, select See what's printing. But if you have frequent problems with printing, that might get tedious. What you need is a desktop shortcut to the print queue. 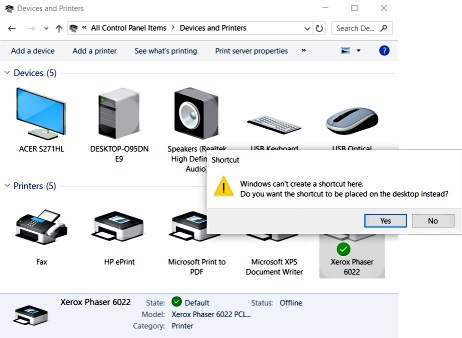 To create a desktop shortcut to the print queue, navigate to the Control Panel Devices and Printers group and right-click on the active printer, but this time, in the popup menu that appears, select Create shortcut. You'll receive a warning message box: "Windows can't create a shortcut here. Do you want the shortcut to be placed on the desktop instead". Click on the [Yes] button. Now, when you click on the shortcut, you'll go directly to the printer's print queue where you can click on the document to select it and, in the popup menu that appears select Pause, Restart, or Cancel.